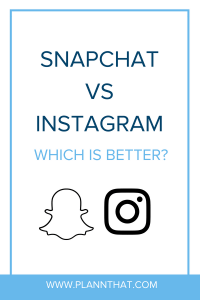 Snapchat vs Instagram: Which one is best for your business? It’s Snapchat vs. Instagram, and it’s the clash of the Titans! In one corner you have Instagram, the heavyweight, weighing in with over 500 million daily active users and a killer marketing stance! In the other corner, the underdog contender: Snapchat with a reported 191 million daily users and its own impressive set of gimmicks and sales strategies! Each vying for victory… or at the very least the chance to be the go-to platform for your business marketing plan. At first glance these champions may look like they offer a lot of the same glitz and glam — strutting around in their gold lame and purple nylon, jeering at the crowds and riling the masses! Seriously, though slightly different in their approach, each platform is vying to be the go-to place for all of your video- and photo-sharing marketing efforts. To the social media marketer, the increasing similarities between the two can make it tough to decide which is worth the effort. So we’ll stop with the nonsense and help you to decide which one really does flex the most ? muscle when it comes to your marketing efforts? We’ve compared the features that the two apps share and come up with an ultimate champion! Spoiler alert: If you’ve taken note of the numbers above, the victory should come as no surprise. Almost a year ago, Instagram stole a move from the Snap playbook when they rolled out their version of Stories. Not only did the new-to-Instagram feature have the same name, it also had the same basic function: that users could share profile video updates that were temporarily viewable (for 24 hours). Let’s forget about the fact that more people are using Instagram Stories than the entire body of Snapchat’s DAU and take a comparative look at the overall experience of using the feature on both platforms. At first glance, the Stories option is just much easier to access within the Instagram app as it is literally the first thing you see at the top left of the screen as you open the app. You almost can’t help but to make the feature your starting point within Insta, forsaking your instinct to jump headlong into the scroll. In addition to that obvious positive, Instagram Stories offers plenty of stickers, filters, location tags and drawing tools which make it a super interactive experience and allow you to bring an extra layer of muchness to every post. We’re not huge fans of the autoplay feature of the Instagram Stories. And the fact that anyone can know when/if you’ve viewed their story is a slippery slope that can lead to disaster. We believe that you should be able to stealthily creep through an ex-friend’s Stories without having to give up your stalker anonymity. Although Stories did autoplay in the past on the Snapchat app, they have done away with that feature for the time being. Having the power to watch what you want to watch, when you want to watch it and without anyone knowing is a definite plus. The downside that we found within this app was the overall accessibility of the Stories feature. We have to almost track them down, with a left swipe in order to view them. While we get that a swipe is just a swipe, we think that it’s a difference that matters in this arena. Winner of Round One: Instagram Our choice here ultimately comes down to accessibility and ease of use. Instagram is about order. The visual layout of Stories at the top and everything you need to navigate the app at the bottom make for an organized and user-friendly interface. Everything has a place, and everything in its place type of scenario. After all, Instagram is an aesthetic platform where people manipulate photos and order their placement in order to showcase their product or service in a concise, yet artistic, fashion. It is a place where businesses and brands really strive to showcase the best versions of themselves. Meanwhile, over at Snapchat things are a little less succinct. When you open the Snapchat app you are instantly plunged into the camera app, where you are bullied into creating something right away. This is fine for the creative and snarky types who always have something poetic to post, or radical to rant about. For the rest of us it’s an abrupt transition that lacks fodder for inspiration. Add to that a botched attempt at cleaning up their interface through a recent overhaul that only succeeded in making things more confusing, and you’ve got an experience that is lacking in both symmetry and order. Which is why the Winner of Round Two is Instagram. While appearance isn’t everything, it certainly is important. Don’t ask what you can do for social media platforms, ask what they can do for you. They’re tools, and as such, need to bring something to the table . . . or bounce. You’re not running a charity here, or maybe you are. Either way, function over fashion, am I right? Instagram does come stacked with features. You can message your besties privately. You can share not only to your Instagram profile, or broadcast across multiple platforms with ease. Stories can be shared, with all the cute little filters that make you look adorable (and basic) even on a bad hair day. But these are all just icing on the cake because it’s the photos that remain the focus no matter which feature you’re using. Yes, some of these features are vaguely familiar, and perhaps swiping all these ideas from Snapchat would look bad to their users had they not improved on them (which we feel they did). Speaking of Snapchat, what’s their goal? Are they a private messaging app? Are they a platform for news and information? A means of broadcasting your product and services to a wider world? Even Snapchat has had a hard time identifying its purpose since its original incarnation as a private messenger app with disappearing messages. Awkward growing pains mean Snapchat is having something of an identity crisis. Upgrades and additional features seem to be regularly added without much organization or strategy, which makes the messier and more confusing. It also makes it less likely to be adopted by new users. You guessed it, Instagram. Seeing a trend here? Let’s face it, you’re busy. If it’s an over-complicated process, it isn’t going to fit into your routine. It’s like kale: sure you’ll eat it, but you’re not going to bend over backwards and jump through hoops to get it. Let’s be serious — if it isn’t easy (and rewarding!) then it isn’t happening. Posting a photo? Piece of cake. Sharing a story? Easy as pie. But when you’re building a brand, there’s much more to the whole social media experience. And Instagram understands that easy is better, which is why they’ve made it easy on so many levels. Whether you’re finding people to follow, keeping track of your users, staying in touch with what is happening in your locality, or simply remaining current with topics related to your brand or service, Instagram lets you do it all without a struggle. While other platforms such as Instagram have been consistently improving the user experience, it would seem that Snapchat has been in their own orbit on this topic. Not only have they not made progress on the ease of use front, they’ve actually gotten worse. Even once you’ve gained a username of someone you want to follow, you still need to navigate across multiple screens to make it so. And then just because you’re following someone, don’t think everything will show up in your feed properly. Semi-chronological will be your best case scenario. If you’re waiting around looking for a Snapchat victory, round 4 does not carry the verdict you’re hoping for. Instagram. Again. Surprise. Not really. NumbeRs, numbers, numbers. It will eventually all come down to the numbers. The more people you can reach, while applying the least amount of effort, well . . . that’s ideal. Numbers — like Shakira’s hips, bless ‘em — don’t lie. Did we mention 500 million daily users? And that’s just Instagram. Remember, your one post can also be sent out to Facebook, Twitter, and Tumblr. All in one easy movement Can you say nailed it? Because that is exactly what Instagram did here. Sheer numbers. We could go on and on about this, but let me just say 500 million daily users. And of course, we think you should be using Plann (available for iOS here or Android here) to plot, plan, edit, schedule, and analyze every detail of your Instagram feed. Plann will give you tools to get your Instagram streamlined for efficiency and aesthetics, and your brand will enjoy the rewards that come from that. If you’re comparing these two social media platforms with the question of which is right for your social media marketing strategy, stop. Just… stop, in the name of love! There is really no comparison. 191 million daily users on Snapchat, and they’re too busy sending photos back and forth of themselves barfing rainbows, or being a cute dog, to be concerned with real world stuff. Okay, we’re being a little brutal from a marketing perspective, but you should see how cute we look rotating through our various Snapchat filters! And nothing’s better than that face-swap business. OMG nothing. ?? With the victory going to Instagram again in the fifth and final round, it may seem like we set you up from the beginning on this one. The ending was too obvious, and you were likely rooting for the underdog. Everyone does love a good underdog story after all, and Snapchat does have that clever-yet-basic dog filter. But sorry, Snapchat … Instagram is the king in this ring. Pssst, don’t forget to download Plann for iOS and Android!